Want to grow grapes in the south? If so, you have two choices – plant muscadines or plant another type of grape and fight diseases and pests. Muscadines grapes, (Vitis rotundifolia) are often referred to as scuppernongs. This grape flourishes in our southern climate as it is native to the Southeastern United States and has been cultured here for more than 400 years. The oldest known cultivated grapevine in our nation, known as the ‘Mother Vine,’ can be found down near Manteo. While table, wine, and concord type grapes rarely live for more than a few years in our area, muscadines thrive. This tough native grape can be found growing along woodland edges throughout the south and is easily cultivated in home gardens. Muscadines can be grown in a wide variety of soils except those that don’t drain well. Sandy soils will do just fine. These plants produce the highest yields in full sun, but will also do well in partly shaded sites. Another plus – muscadines have few pest problems and are easily grown organically. Several varieties of muscadine grapes are available. Because some muscadine grapes are female vines and require a pollinator, read the label to make sure you know the pollination requirements before you purchase plants. 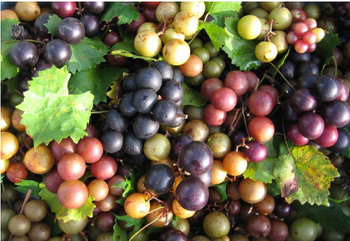 Bronze, red and black muscadine varieties are available. Many are delicious to eat fresh, with a concentrated sweet, taste. They make delicious jams, jellies, juices, and wines. The first muscadine ever selected and named was a bronze variety called ‘Scuppernong.’ This name has evolved over timed as the common term of scuppernong for all bronze muscadine varieties. ‘Nesbitt,’ ‘Fry,’ ‘Tara,’ ‘Southern Home,’ ‘Summit,’ and ‘Supreme’ are all recommended varieties for fresh eating, whereas ‘Carlos’ and ‘Noble’ are the varieties most commonly grown for wine or juice production. Yet another plus – Muscadines and muscadine products are a good source of valuable antioxidants and dietary fiber. Muscadines are hearty growers best grown on trellis structures, which should be put up before the vines are even planted. While muscadine grapes ripen from late summer through fall, the vines are best planted in spring. Space new vines at least 10’ apart and be prepared for a 3 – 4 year development period to start heavily bearing grapes. Established vines are pruned heavily each winter when they are dormant as they will produce fruit on new wood. In the dormant season such as now, prune back all 3-inch-long wood (called “canes”) that grew the previous year to fruiting spurs. If you would like more information on this technique and about this marvelous fruit, join us on Saturday, January 26, 2019, from 1 to 3 p.m. This will be a hands-on pruning workshop in Sanford. Call the N.C. Cooperative Extension of Lee County office at 919-775-5624 for more information and to register. Minda Daughtry is Horticulture Agent for North Carolina Cooperative Extension in Lee County.